Exploring the large underwater world can be addicting and those who have done it once will often quickly go back for more. This largely unresearched and unknown area of the world is appealing to more and more people every year. 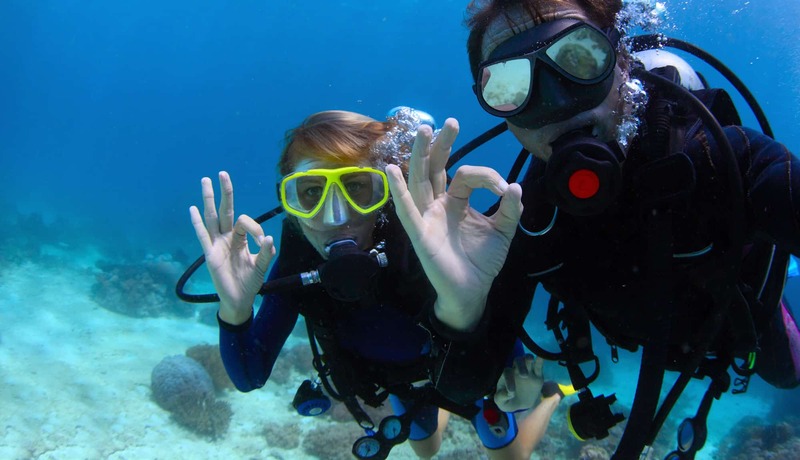 Scuba diving is typically a very rewarding and fun experience but as it is in a very unknown area, it is important to have many safety measures with you for your dive. An important safety measure to always have on hand is a dive computer. This will allow you to monitor various information when exploring deep into the ocean. When underwater it is easy to get disoriented and not know direction and even what depth you are at, especially for new divers. These devices will effectively log your dive and is also the most important and easiest way to avoid decompression sickness. 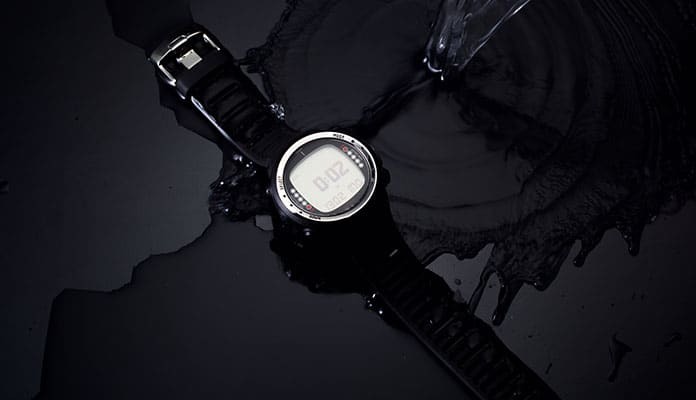 In a sleeker, everyday design, they have now come out with dive watches that allow them to translate to everyday use. The best dive computer watch is lightweight and can be worn just as a regular computer. It may be hard to tell what the best scuba diving computer is, that is why we have done the research and listed our top ten choices below. These are the most popular and the highest rated dive computers in 2018. This is the best wrist dive computer that is perfect for entry level divers. It tracks your descent and ascent and alerts you if you move too quickly. The easy to read screen shows your air and nitrox levels, date and time, depth and temperature. Large buttons allow you to quickly move through the interface while the highly configurable band will fit your wrist. 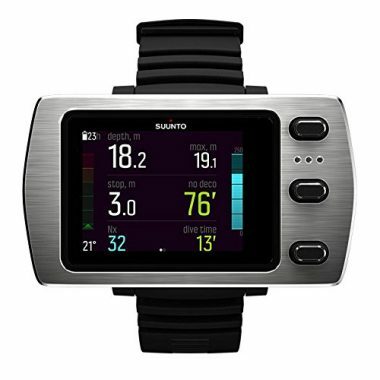 The Suunto Zoop Novo Dive Computer is a top of the line option for divers that are entering the sport. It will allow you to start and grow without needing a new computer any time soon. 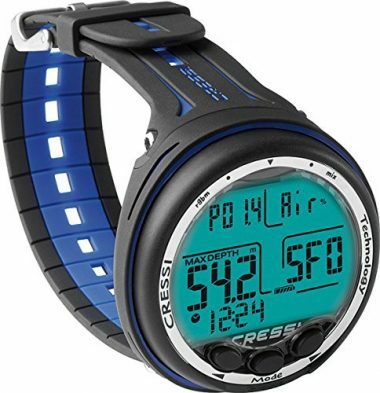 Displaying depths up to 120 meters the Cressi Giotto Wrist Computer will allow you to take this with you no matter where you dive. A simple three button system allows you to navigate through the interface with ease which is readable on the large 2.6 inch screen. Included in the system is a large 3 Volt battery that is easily rechargeable with the travel charger. With all the standard alarms and indicators you can rest assured that you will be taken care of by this wrist computer. Up to 70 hours or 60 dives can be saved where you can compare your time and details with ease. This is the best wrist style dive computer that has everything you need to enjoy the perfect dive. 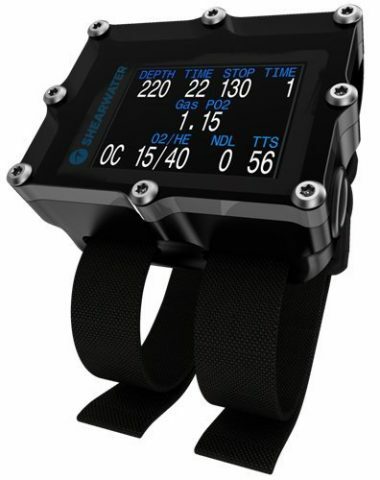 This is the best affordable watch style dive computer that is perfect for those new to the sport. With a single button interface programming Air, Nitrox and Gauge is a breeze. An edge to edge high definition screen makes this computer easy to read while still being incredibly compact. Traveling is made easy with this computer’s size and long battery life. The battery life is clearly indicated on the screen so you can be assured you have enough time before your dive. 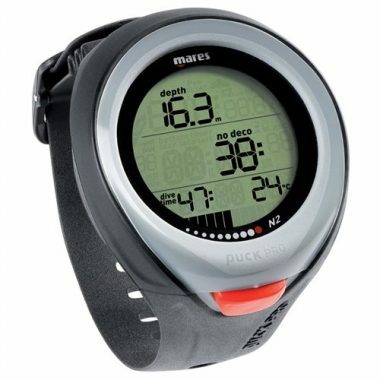 Equipped with a 60 dive, 70 hour logbook memory function you will be able to track your progress. With audible alarms this dive computer is built with safety in mind. This computer is able to dive into depths of 120 meters and work with altitude adjustment up to 3,700 meters, this watch effortlessly goes where you go. You are able to fully reset this computer after each dive which makes it a great option to share amongst friends. This simple looking scuba dive watch computer is a full featured high end piece of technology. With four modes, including air and nitrox, you will be fully updated with the amount of air you have left. 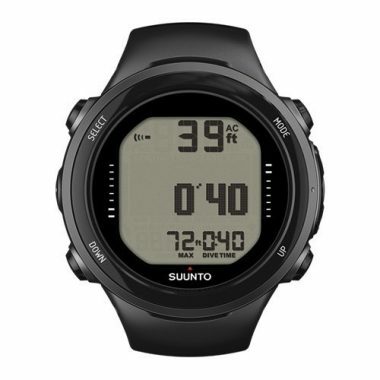 Suunto’s built in decompression algorithm will make your dive the safest possible. If you are ascending too quickly an alarm will alert you to slow down or even stop. As technology advances your firmware should too. This is why Suunto’s firmware is updateable keeping you updated as more is learned about this sport. All of this Suunto dive watch is strapped to your wrist by an ultra comfortable strap system. There is no question Mares makes some of the best quality wrist dive computers available on the market. The Mares Puck Pro is no exception. With a large easy to read screen and it’s lightweight design it is an excellent option for any level diver. A single button easily navigates the menus while a large round screen provides all the information you need no matter how you dive. The battery will last you hours of diving and can be replaced for when a second battery is needed for remote dives. This Mares option is one of the top dive computes on the market today. This dive computer from Shearwater is an exceptional piece of technology. The brightly colored 2.4 inch screen shows everything you need to know in a small compact design. Stainless steel screws hold the waterproof plate in place while a dual strapping system ensures this high tech scuba computer stays on your body at all times. Overall this is a high quality setup that will give you the information you need when you need it. Not only compatible with air, but also Nitrox and Trimix this dive computer will log up to 1000 hours of your dives. The Shearwater Research Dive Computer is multi functional and will serve you for years to come running off a single rechargeable AA battery. This stylish computer has a high end stainless steel accent ring. With a Dual Algorithm and Deep stop option the upgrades in this watch are easy to see. With four different operating modes personalizing this computer is easy. Watch, gauge, norm and free options allows you to personalize your dive to be completely your own. This computer watch is incredibly user friendly with an interface that allows you to navigate your way through menus with ease. Equipped with a 24 dive-on unit log book allows you to track your activity. Onscreen history mode allows you to track total number of dives, maximum depth, total dive hours, and lowest temperature. This Mares dive computer is capable of 200 dives on a single battery with a capacity to record up to 36 hours of information. You will be able to dive to depths up to 150 meters (492 feet) allowing you to grow into this setup. The scratch resistant LCD screen is easy to read even in direct sunlight. Everything from temperature, depth and ascent rate are shown on the large face allowing you to stay up to date on your crucial stats. Alarms are able to be programmed or shut off completely giving you full control of every aspect of your dive. No longer do you need to worry about your watch becoming outdated as the firmware is easily upgradable. This option is a great option for beginners or advanced divers alike. Not only is this good looking but also a fully featured dive computer. 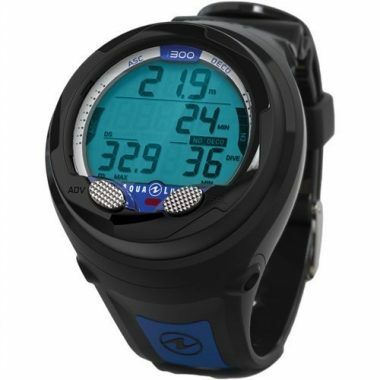 The Aqua Lung i300 wrist dive computer comes with everything you expect from your dive computer making it one of the best on the market. The large screen is broken into many different sections giving you quick access to all the necessary options and figures you need. No matter what kind of air you dive with, including trimix, this computer will be able to give you accurate readouts of the stats that matter the most to you. Not only that a complex algorithm allows you to control your decompression to perfectly time your ascent to the surface. Simply hook this system up to your computer to see your dive stats to prepare for your next dive. This will allow you to compare your dives and show you where you can improve. 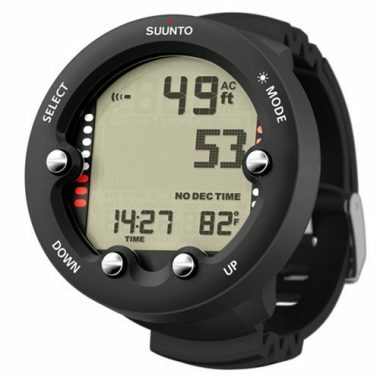 The Suunto EON dive computer is one of the most advanced systems available. An exceptionally large and colorful screen displays graphs and models instead of only numbers. This will allow you to quickly see how your dive is going with a single glance. Three large buttons are generously spaced out giving you confidence even while wearing large gloves. A larger unit means that a larger battery is included in this model. 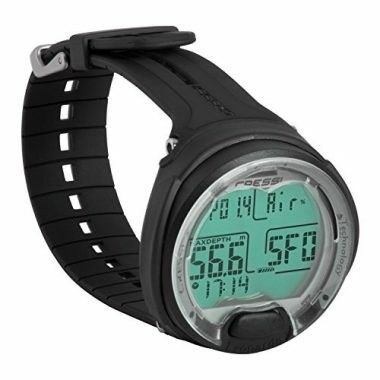 The large fully adjustable strap will ensure this unit stays on your wrist giving you the data you need. Features such as rebreather and trimix capabilities will give you the options to grow into this computer without needing to purchase new ones over the years. Dive computers have become a lot more advanced in recent years with supreme technology that every diver will enjoy. Originally being created in the 60s, diving computers have shrunk in size and grown in function. Used by novice divers and professionals alike, it is hard to find a diver that doesn’t use one. Dive watches being a thing of the past, scuba divers now turn to dive computers or wrist dive computers that provide a lot more information. Providing accurate depth readings, tracking total dive time and ascent rates this is a must have safety device. Lots of divers around the world still rely on dive tables to calculate all their information for their dive. These tables can be used to calculate Nitrogen levels, surface interval time and recommended underwater times. While still a great way to monitor your dives, technology advances have created a far easier and more accurate way. Dive computers automate this technology to give you a more accurate real time calculation of all your diving information. There are limitations with the functions dive tables have, the biggest being they weren’t created for recreational divers. Originally being a resource for the Navy, dive tables are designed to go from the surface, down to the desired depth and then back to the surface. They are not designed for the typical recreational diver that prefers to descend and then bounce between different depths as they hunt for corals, fish and through wrecks. These tables are ideal for avoiding decompression sickness but do not have the flexibility to provide accurate protection. Dive computers offer supreme safety and an up to date log of your dive. During your open water certification, you are taught a lot about the different things that happen to your body as you descend below the surface of the water. Specifically, how your body absorbs Nitrogen as it goes into the depths of the water. There are many factors that affect the rate of absorption your body experiences, specifically weight and body type. As you descend deeper into the water, your body begins to absorb higher levels of Nitrogen. The amount of Nitrogen your body absorbs will determine the length of time you must wait between dives. Dive Computers are ideal for divers as they measure all of your gas rates for you keeping you at a healthy level. Algorithms are put in place to calculate your absorption and release of Nitrogen in half-life intervals. When 50% of your bodies Nitrogen levels are released, this becomes the half-life. Your dive computer will calculate the pressure at the start of your dive and measure the Nitrogen saturation of each body structure. Measuring the time and pressure of your dive, the dive computer then uses the maximum ascent rate to calculates the percent of safe Nitrogen absorption. The dive computer then goes on to measure the amount of off-gassing, the amount of Nitrogen your body releases, to calculate the amount of time that is needed to diving information stays at the surface between dives. It is clear to see why this is far too advanced for a simple dive table to calculate. Diving computers are one of those pieces of equipment that are far safer to own yourself than to rent. When used properly, they are an incredible safety feature that can make your dive much more comfortable. This is especially important for novice divers as dive tables can be too confusing to use. For those who dive frequently, owning your own wireless dive computer is incredibly important as it will accurately record all dives from previous trips helping to ensure your body Nitrogen levels remain within safe limits. Some places, such as live aboard dive trips, require that you have your own dive computer to ensure your dive is as safe as possible. Dive Computers are something that you can continue to use as you gain more experience with the sport. Almost every experienced diver will have their own computer. As the demand for dive computers has gone up, there are more and more options of computers to choose from. In general, there are three main types of dive computers all with unique features and options to help you get a computer that is perfect for your needs. Wrist mounted computers are highly popular amongst beginner divers as they are easy to monitor and wear. Console mounted dive computers have larger screens and are quite a popular choice amongst divers. Additionally, scuba mask computers are available and are the most uncommon choice of the 3. 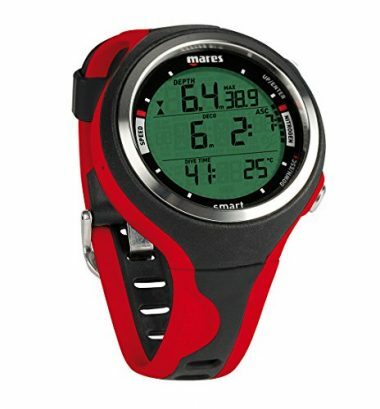 This is the most commonly used dive computer style as it is easy to use and even easier to wear. 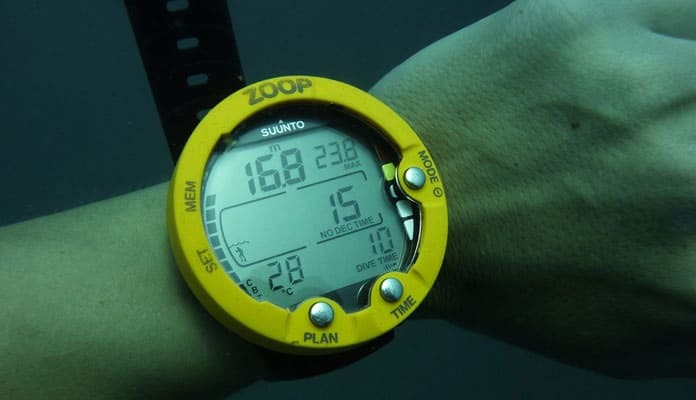 The convenience of having your information displayed on your wrist makes this such an appealing option for divers of all skill levels. Looking just like your everyday watch this style is packed with technology that makes it a divers dream. Using wireless technology this wrist dive computer is convenient to see when exploring the depths of the ocean. 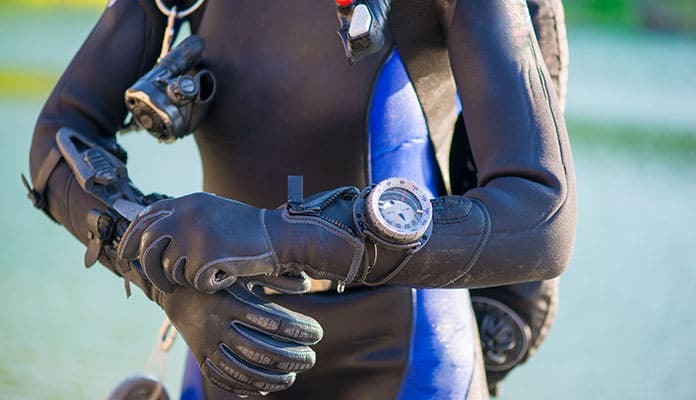 Dive watches are often mistaken for wrist dive computers but feature far less technology. The dive computer accurately measures their air consumption and remaining amounts of air in the tank. Dive computers designed for beginner’s feature all of the must have technology measurements needed for basic diving. Accurately measuring and displaying the total dive time, the depth of your dive, ascent rates, no stop limits, no stop time remaining, and emergency decompression. It also has a memory that records all the information from previous dives. To ensure you don’t run into an emergency below the surface, these watches have low battery warnings that help to remind you of any battery shortages. Typically, the display on these models is easy to read and easy to program. These wrist computers are typically both air and nitrox compatible. More experienced divers often prefer higher quality gear with added features. Having all the same functions as a beginner dive computer, these ones tend to incorporate a few more features. All advanced dive computers are air integrated which means they work with your air tank to give you real time information about the remaining air. These are also ideal for those diving above sea level as they can be manually or automatically adjusted to compensate for pressures. 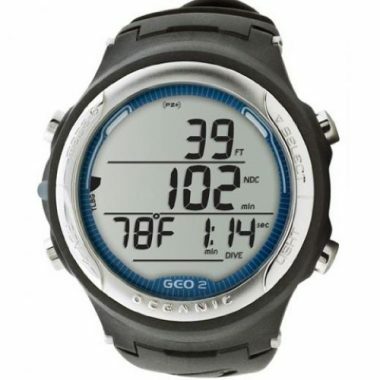 Thermostats, clocks and digital compasses help to give you even more information while you are diving below the water. This style of dive computer is compatible to connect with your home computer allowing you to download your data to better keep track of all your dives. Rechargeable batteries help frequent divers cut down costs and eliminate waste. Some advanced dive computers even have special screens that allow divers to play games during decompression and safety stops. With a market so heavily saturated, it is important to know some key features that are important for you in a dive watch. Generally speaking, there are 9 key factors to consider when looking for your next computer. You will need to ask yourself what your level of skill as a diver is. Professional divers obviously require a lot more advanced technology than someone new to the sport. Beginners are likely to overpay for features they won’t ever use if they opt for the best of the best. Be sure to not just think about the now and instead plan for how you expect your diving to advance in the near future. Advanced divers will want to opt for a diving computer that is more in their skill level by ensuring it has the key features they desire, such as air integration. Prior to starting your search for a dive watch, it is important to consider how much you are willing to comfortably spend. This will help to narrow down the watches that are available within your budget. We recommend trying to be as flexible with your dive watch as possible as this is not something you will want to cheap out on. Being a great safety feature in the water, it is important to buy according to your skill level so you get the maximum amount of efficiency and use out of your watch. If your budget is not an issue, then you can enjoy a full range of the dive computer world. A dive computer is only useful if you can read and access the information that it is giving you. Paying attention to the display of the computer when deciding on the ideal one for you is extremely important. While it may be easy for you to see with your bare eye above water, it can be far more difficult when wearing a mask and in underwater conditions. Be sure to check that your computer has a backlight which makes it more easily readable as well as a wide-angled color screen. Be sure to check that the digit size is large enough for you to easily read as well. Whether you are using nitrox for your dives currently or considering a switch in the near future, we recommend selecting a watch that is nitrox integrated. These watch types allow you to dive with air or nitrox giving you the freedom to dive with whatever you choose. Many divers enjoy the option of uploading the log of their dives to a home computer or laptop. This allows you to safely transfer all of your data and graphs to your computer to provide you with an easy tracking tool to see your dive progress. This allows you to upload your time, depth, ascent rate, air consumption rates and percentage of nitrogen. A digital compass will allow you to see the direction you’re headed without a dedicated analog setup. Having it built into your computer allows you to conserve space. Analog versions require additional space on your arm. The only downfall to having this built in is that it can be thrown off by any sort of magnet. We strongly suggest that your dive computer have a replaceable battery system. This will ensure that you have enough power for all of your dives during the day. You can even have a second set that can replace a dead battery as well. Be sure to bring along the charging cable to be extra sure you have enough juice. What Is A Scuba Diving Computer? Being able to track your dive is a crucial aspect of staying safe. A dive computer will have all your data available in a small compact setup. Knowing things like how long you have been underwater and your diving depth will allow you to plan your route and alter your breathing accordingly. These little dive computers can actually save your life. High quality scuba dive computers can alert you of a fast descent or ascent which can cause dizziness or even the bends. This happens when you ascend to quickly which cause air bubbles to form in your body which can be fatal. There are many features that these little pieces of technology provide that can make your dive more enjoyable. What is your level of diving? Different levels of divers will need different dive computers. Beginners to the sport may not need fancy features that more advanced divers need. The most important thing beginners should look for is a large easily readable screen and has an easy to use interface. This will ensure you will not run into trouble while under the water. More advanced divers should look for advanced features relating to decompression and a more advanced interface. There are many things you need to have in your dive computer. This is one of the main pieces of gear that can help you through every step of your dive. Scuba Dive Computer reviews agree that the following are the most important things to consider before making your purchase. Even if the dive computer has the latest technology and a crystal clear LCD screen if it is not easy to use it is not worth the money. Being able to navigate through the menus with gloves on is a key aspect you should consider when buying a dive computer. Large, space out buttons will make your trip underwater easier and instill confidence in your equipment. We recommend spending time learning your system before entering the water. This will save you time, energy and confusion while on your dive. We suggest reading the reviews of the product on the lookout for how easy the computer is to learn. There is no point in spending the money on a dive computer if you are not able to read the screen with your mask on. It is highly recommended to find a computer that has a multi colored or bright screen that allows you to easily see the readouts. A dark text color on a light background also creates enough contrast to see the critical writing. Not having to shine a light on your screen will save you a step and allow you to spend your time on other things. It is also important to get one with a large enough display to easily read. A few gauges you can live without but in depth, how much air you have left and time under water are ones that you cannot. Being kept updated in real time about your dive is critical for not only safety but peace of mind. Knowing how much air and battery you have left is not something that can not be accurate as it could affect every aspect of your dive. Some dive computers will help you with your decompression time. They will have specially designed algorithms that factor in the depth and decent time which will output how long your ascent should be. If you are traveling too fast they can even tell you to stop and hold your depth while your body gets accustomed to the change in altitude. Being able to easily see your computer is a key aspect to consider when looking to purchase a dive computer. Many are worn on your wrist while some attach to your suit. Being able to simply turn your wrist and have all your information available to you is a sought after feature. While others like their stats more out of the way allowing their arms to be free from the added weight. This is personal preference but should be thought out for your next dive. One way to tell the quality of your scuba gear is by the warranty. All dive computers will come with a one year warranty while well made ones will come with up to a two year. Longer warranties indicate higher materials used to make the product. Look for dive computers that have a two year warranty whenever possible. Dive Computers can cost anywhere from $199 to upwards of $1700. If you are just entering the sport of diving you may not need a fully equipped dive computer. Finding one that has the gauges and specs you need is key. Sacrificing high tech features can save you some money but may be missed when you develop more experience. Color screens will also increase price and are not always necessary. Being able to connect your dive watch to your computer will allow you to compare your dives over time. This will show you how you are progressing and stats you never thought of during your dive. You will be able to see everything from the depths you travel to your time underwater. This shouldn’t make or break your decision but is a nice feature to have at the end of the day. Most diving computers come with memory logs built into the device. This may be measured by time in use or number of dives but is a nice feature to have when tracking your diving progress. It allows you to save your dives and compare them with each other. Q: What Is A Dive Computer Used For? A: Dive computers are small devices that should be used by every single diver. They provide an immense amount of safety for a diver and should be worn by everyone entering the water. These help to track your dive and make your experience safer. Tracking your depth is important to ensure that you do not hit depths beyond your skill level. This is important as it is easy to get carried away with exploring the life below the sea and forget to monitor your depth. Dive computers track your total dive time and monitor your dive in terms of compression. They calculate when to take safety stops and are specifically important when looking to do many consecutive dives. This is important as it will reduce the chances of problems such as decompression sickness. Q: What Should I Do If My Computer Stops Working During A Dive? A: If your dive computer stops mid dive, it is wise to end your dive. While this may not be something you want to do, it is important to be safer rather than sorry. If your diving buddy has a watch on them and it is your first dive of the day, you can use theirs to help navigate your dive. If they do not or you have been on multiple dives in a day, be sure to begin your ascent taking a safety stop on your way. Replacing the batteries on your computer, you will be able to go right back into the water and continue diving. Q: Can Computers Replace Compression Tables? A: Yes! Dive computers measure everything for you in a convenient and incredibly reliable way. When using a scuba dive computer, you no longer need to use compression tables as all the work is automated and done for you. This makes diving much easier and safer than ever before. First, you will need to input all the data from your dive and then your computer will automatically calculate the bodies inert gases during your dive. Tracking your dive time, depth and ascent rates these devices are much more reliable than compression tables. As your scuba diving computer travels with you along your dive, they update in real time making them far more accurate. Reducing the guesswork out of your dives, using a computer should be something every diver does. Q: Are Dive Computers Suitable For Beginners? A: Yes! Every single diver should have their own personal dive monitoring device regardless of their skill level. It is specifically important for beginners to have a dive computer as it provides an added level of safety. Taking all the guesswork out of calculating your dive, computers help to navigate you and allow you to focus more on your surroundings. 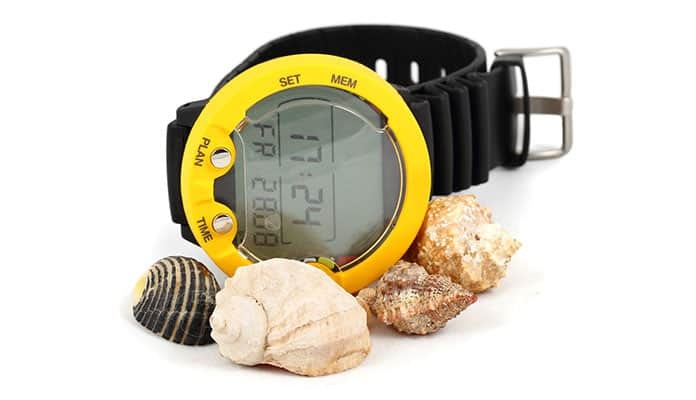 While many beginners prefer to opt for a dive watch, a dive computer is more than appropriate for a novice diver to use. Dive watches are worn as a regular watch on your wrist which makes diving with it a bit easier. Other divers love the bigger display screens that dive computers have. In the end, it’s all about preference. Q: What Are Air Integrated Dive Computers? A: This special type of dive computers works just like a regular dive computer with an added layer of protection. Working alongside your air tank these computers also measure your remaining air time and cylinder pressure. This is in addition to the depth, time and decompression calculations a typical dive computer measures. This is a great safety feature that is specifically useful for new divers. Airtime varies on an individual basis. Consumption rates, depths, and diving conditions all play a part in determining how much air you use during your dive. Having an air integrated dive computer takes the guesswork out of planning your trip by hooking up directly to your air tank and providing real-time information about your air pressure. This impressive safety features gives you the best understanding of your dive and reduces the likelihood of any out of air emergencies. Exploring the underwater world is something everyone should experience. The escape from the world into a majestic underwater life can surely become addicting. While this is typically an incredibly rewarding experience it is important to take as many safety precautions as possible to give you peace of mind. A dive computer on hand allows you to track your dives so that you can monitor your process. It also allows you to understand the depth, time below water and tracks the air you have remaining which will keep you safe no matter what depths you’re diving at. This is the biggest factor in reducing the chances of decompression sickness which can be potentially life-threatening. With the help of the best dive computer, you can assure that your time underwater is both safe and incredibly enjoyable. Have you tried any of the dive computers on our list? Have a favorite we didn’t mention? Chat with us about it in the comment section below.